I picked up this book in summer from a boot market and saved it in my winter stash for when I don’t have time to go to the library. The first thing you think of when looking at this book is Memoirs of a Geisha, and indeed this author is the person who collaborated with Arthur Golden to provide the inside details of a Geisha’s life for that book. In this memoir she turns to her own life and how she came to be a Geisha, or person of the arts as this translates to. She describes her early life in a chaotic and loving home with her artists parents and how on seeing her beauty, the owner of an okiya – the residence of a geisha - attempts to convince her parents that this would be a good career for her. I would have assumed before this book that there was stigma regarding such a profession and Iwasaki does say that outside of Japan there is an incorrect belief that the work of a Geisha is akin to prostitution. She insists that it is an art form specialising in dance, conversation and the intricate tea ceremony. Perhaps then it is not so surprising that when the young Iwasaki shows an interest, her parents allow her to go to live in the okiya. The biggest chunk of the book is taken with the details of a Geisha’s training – learning to wear the clothes, learning various forms of very controlled dance, learning how to talk to and entertain people, how to enter a room, how to network with other okiya and with the tea-houses and perfecting the tea ceremony. 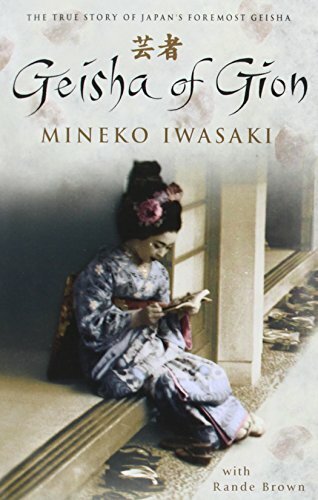 The rest of the book details Iwasaki’s rise as she becomes famous in Japan and her subsequent disillusionment with the hierarchy and restrictions within the profession, her search for love and her decision to leave the “flower and willow world” as the geisha district is known. She also describes the rivalry from other women during this period and the cruel jibes and tricks she has to endure because of their jealousy at her success. I learnt a little bit Japanese culture through this book – the value and beauty of the kimono, the incomparably high value placed on pride and honour and how central art is to the life of the Japanese. I also had an incorrect stereotype at the back of my mind of Japanese people being somewhat cold – perhaps because they are not traditionally known to be over-expressive. This memoir challenged that thinking because of Iwasaki’s description of her home life and the numerous kindnesses shown to her throughout her career. This is a fascinating and easy to read book which would be interesting to those curious about traditional Japanese culture, but perhaps not to every person’s taste due to the specific nature of the topic. I've had this book sitting on my shelf too, been meaning to get round to reading it, your review has prompted me dust it off and start reading!!! I loved Memoirs of a Geisha; and due to the similarities I had picked it up in the first place. I came across a book last week, called The Gargoyle by Andrew Davidson, which I think you might enjoy! Yaaaaay, another book review. I love them! I too read Memoirs Of A Geisha and liked it, so insha'Allah I shall read this too. Jazaki'Allahu khair once again, for making this bookworm happy! PS: Thanks Anonymous, I'm going to check out the Gargoyle one too. I would love to hear what you thought, thanks for the reccommendation, from the reviews The Gargoyle does look like a gret read. Jazakh’Allah-khairun for your words, although I enjoy writing my book reviews, I do wonder if anyone reads them. Umph.. my library doesn't have this book!! So I can't give much feedback until I get a copy. But insha'Allah I shall check out all your other reviews!